So you need a ton of top soil? or ‘tonne’ if you want be be picky about the correct spelling. Few people understand the volume of a tonne and have problems with either under ordering the correct amount of soil, or, over ordering. The later is a great problem in most cases. Getting rid of excess soil can often cost as much as the delivery of the soil in the first place. So how much (volume) is a ton of topsoil? In metric volume = 0.6 cubic metres. This is where the confusion happens. Mostly from the very companies selling topsoil. When ordering topsoil, always check the volume rather than weight. If you have calculated the the cubic meterage needed this is going to be far easier than doing weight to volume calculations. With delivery costs being high and the cost to subsequently remove excess soil being far higher it is worth spending a few moments to calculate the correct amount needed for your garden project. Be very cautious where you purchase topsoil from. If it is cheap it is no doubt sub soil (not suitable for planting) and / or contaminated from brown field sites. Builders waste from the footings dug for extensions. The risk of buying cheap soil from any thing other than an unassured source, not conforming to the British Standard regarding topsoil is it could have Japanese knot weed! If you are unaware of this weed, Google it! Possibly the most disastrous weed to bring into your garden. Most mortgage companies are now refusing to lend on properties with Japanese knot weed and potential purchasers will certainly be put off. Don’t risk it. Spend the extra few pounds for a ton of quality top soil! Using a top soil calculator on-line can be one of the best ways of getting the quantity of soil needed correct. Beware when using a soil calculator, often you will need to enter in your width in metres, the length in metres but the depth is in mm. An excellent top soil calculator can be found here. 2 x 2 x 0.2 = 0.8 cubic metres. As mentioned earlier in this article be very aware of cheap topsoil. Cheap topsoil in many cases will not conform or carry the British Standard kite mark. The current British standard for topsoil is BS3882:2007. With the rise in landfill costs, most skip hire companies are now recycling the soil returned in skips and selling it on. A trick of the trade being used is to mix a 50 % sub soil or soil not suitable for gardens and a further 50% of organic matter so it looks suitable for use. When it arrives with the customer, all looks good to the untrained eye but by the time the delivery is made, the lorry has driven up the road it is too late. Your stuck with it! Still want to use cheap topsoil??? Screening topsoil is simply the operation a supplier of topsoil uses to remove stones / debris from the soil. For example, a screened ton of topsoil sold as screened to 10mm means there will be no stones / debris in the soil over 10mm (1cm) in diameter. Choose your topsoil supplier very carefully.Does the supplier carry the current British Standard? Is it safe? Where does it come from? Is it peat free? A reputable supplier would be only to happy to answer these questions. If not, hang up the phone! Specific topsoil is available for new lawns. Beds and borders topsoil or a general use topsoil is not very suitable for lawns. For a healthy lawn a soil that has a higher sand content and less organic matter is favoured. 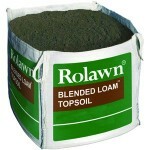 Rolawn manufacture an excellent lawn topsoil manufactured for this sole purpose.